A second book is vulnerable to all the pitfalls of a ‘second’ anything – especially if the debut novel that it follows was exemplary. There’s the weight of expectation, the pressure not to betray the existing readership’s trust, the challenge to overcome the possibility of being a one hit wonder. However, Hudspith and his readers can relax. This new book delivers. It more than meets expectations. It keeps faith with the readers of the first book, ‘Kimi’s Secret’ and proves that the author is certainly no one hit wonder. In fact, I’d go so far as to say that ‘Kimi’s Fear’ is better than ‘Kimi’s Secret’. And I loved ‘Kimi’s Secret’ – as did the many young people I know who read it. I find it hard to believe, but the new book is a pacier, rather slicker read than its predecessor. Its themes of love, loyalty, betrayal, and challenge are more boldly stated. Kimi and her world(s) are even more vivid. Kimi’s adolescence – her awkwardness at being caught not only between the worlds of Earth and Heart but also between childhood and adulthood are movingly described – and this will surely resonate with all readers. 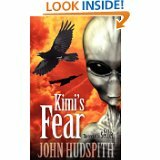 Because Kimi is a year older in this latest book, then the handling of the themes and the vocabulary used are more grown-up – but Hudspith has pitched it just right for his core pre-teen and young teen readers. As in the first book the plot is stunningly imaginative and complex – but as with Babbage although there’s a danger of disintegration – Hudspith has complete control and maintains the rigour and integrity of the whole throughout. The twists are unpredictable – the Perry/Gorgeous scenario to name but one – and the end leaves you wanting more. Although largely set on this planet’s parallel world of Heart (still love that anagram) – the book is earthy, real and rooted in the modern world. The shift in Kimi’s location is a fantasy but it has a lot to say about real life too. In ‘Kimi’s Fear’ it’s as if J.K. Rowling meets Enid Blyton – and then Stephen King comes along, takes their best bits and does a mash-up. Hudspith – one hit wonder? No fear!